The Fenix P2D is the C123 version of the Fenix L1DCE. It has the same user interface but uses a C123 lithium battery instead of the AA battery used by the L1DCE. Both lights use a Cree LED, so they are extremely bright for the size with very good balance between throw and side spill the hotspot is very strong and the spill is really usable. As in other Cree lights the beam has some artifacts and will not be very pure against a white wall but that causes no problems to use the flashlight. The light has two modes of operation depending on the position of the bezel. In each mode of operation you can access different submodes using the reverse clickie switch. With the bezel in the first position you turn on the light in "turbo" mode (max brightness), a light tap in the switch then moves to the strobe. With the bezel in the second position the light is turned on in minimum brightness, the you move to medium, maximum and finally SOS mode clicking the switch. From any mode you can twist the bezel to go quickly to either maximum or minimum brightness, this is what makes the interface very nice to use. 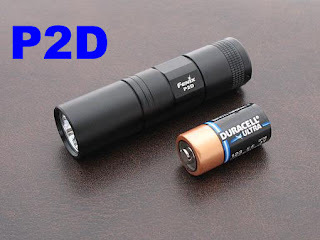 The P2D uses a C123 lithium battery and reaches up to 100 lumen in "turbo" mode it can use rechargeable 123 batteries but you lose some of the modes until the battery voltage drops a little. The head of the light can be used in a P2D or L1DCE body indistinctly so if you get one and an extra body you have both lights, the reverse clickie switch works in both flashlights. Both lights are constructed in HA-III aluminium, very strong and will resist drops scratches and impacts. The runtime is about 1 hour in "turbo" and up to 30 hours in "low", 2 hours in "max" and about 5 hours in medium brightness. The strobe's frequency is good enough to disorient people. The P2d can stand on its tail and be used for room illumination. We really liked the UI of the P2D, you have a quick way to get Maximum or Minimum brightness and from Max you are only one click away from the strobe, this has been simple to use in our tests and very flexible for an EDC light. The only detail is that most of the P2D units we know have a beam with a distinctive greenish tint and artifacts due to the LED being offcentered, so if you like a smoth beam of pure white light the P2D may not be your best friend. You can read more or order from Fenix-Store for $55. The Delta Force is a premium folding knife made by Surefire, the knife is a S30V steel blade with a thick titanium frame, besides the knife the Delta Force has some aditional useful tools that are barely noticeable. When closed the knife is 4.7 inches long extending to 8 inches when opened, the blade length is 3.37 inches. The total weight of the knife is 4.6 oz. The frame has some interesting tools the index finger guard is shaped to work as a screwdriver, at the top of the frame near the thumbhole there is a wire cutter/crimper that can cut up to 12 gauge wire. At the back of the handle there is a small fixed blade that can be used as a seatbelt cutter or for cutting cord without opening the knife. The center of the frame provides a 1/2" hex wrench and toothed slot for loosening smaller nuts down to 13/64" size. Finally at the back of the knife there is a window breaker tip made of 440 reinforced steel. The grip is very good due to the large handle with ample space to rest the index finger and allowing several different grips, the pocket clip is strong and reversible and it is very low profile interfering almost in no way with the grip of the knife. The S30V blade cuts very well and is extremely strong, the titanium frame body is resistant to corrosion even of sea water and virtually indestructible. The lock is a liner lock that works very well and seems to be very safe. 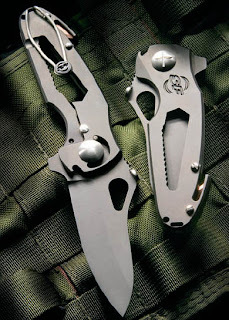 Without a doubt the Delta Force is a premium knife with some very unique features that make it a very recomendable folding knife for EDC, the knife itself is excellent and the extra tools make a very interesting package. It may be a little large for EDC purposes but that varies. You can read more at Surefire's website. Checking for stock is recommended for this knife. The Hartsook is a very slim and light fixed-blade knife designed to be used in a necklace or similar. It is made of S30V premium stainless steel coated by black oxide. The overall length is 4 1/4'' (10.8 cm) and the blade is 1 7/8'' (4.8 cm). The total weight (without sheath) is .5 oz (15gr). The blade is nicely shaped with thumb grip ridges in the opposite edge in two places. This ridges can be using for scraping and other jobs where the plain edge could be damaged. The shape of the handle is nice to hold and the grip is quite strong, the one piece construction makes the knife very reliable and safe to use. The neck sheath holds the knife well and is secure enough to wear around your neck without serious danger but as with any sharp object around you being careful is recommended. Being very light and strong the Hartsook is an affordable choice for a fixed neck-carry blade that can be used in a very huge number of activities such as camping, fishing and general cutting jobs. You can read more about it in Buck's website or order for $23 from KnifeCenter. 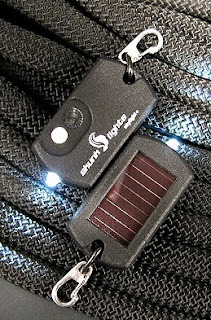 The Skunlight is a solar powered flashlight using a nichia 5mm LED. The light is very small only 51mm x 28mm x 10mm, about the size of a large dog tag and weights 20g (0.7 oz). The light is charged using Sunlight with the cell panel in the back, after 5 or 6 hours of charging the light will run for aproximately 3 hours. An auto-off feature will turn it off it left on for 10 minutes. A battery indicator will flash if the batteries are low and need charging. The internal battery is lithium-ion so it can be charged and recharged constantly without any damage, it is recommended to charge as often as possible without running the light down to preserve battery lifetime. The light is solid and waterproof down to 1 meter. it can be used clipped to a keychain or in a necklace, clipped to backpack or anywhere where it can receive sunlight in good conditions. The White LED is quite bright, very intense for a 5mm LED and the 30 degree angle makes it suitable as a navigational light, task light and signaling light of moderate output. Not needing batteries at all makes the Skunlight a nice backup light for outdoor activities or emergency kits. If runtime is a concern to use it as an emergency light there is a red led blinking version that can last up to 20 hours after a charge. The red led drains less power and the blinking further reduces the consumption. Unfortunately there is no version that can be either blinking or constant on. You can read more at the white led product page, the red blinking product page and you can order from Tad Gear for $29. 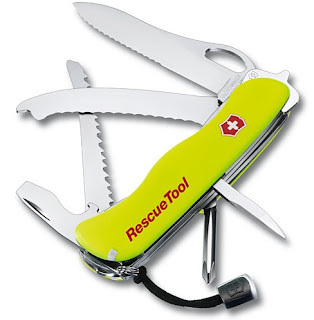 The rescue tool is a product created by SAK manufacturer Victorinox for rescue and safety services, SAR, fireman, policeman and others. It's a tool that offers the elements that are most needed in a rescue operation, it can be used with gloves and has a luminiscent body. The crate opener and the blade can be locked using a liner lock mechanism. The tools included are: a large blade that as mentioned can be locked, philips screwdriver, window breaker (can be removed), strong screwdriver/crate opener with cap lifter and wire stripper. Reamer, curved seatbelt cutter, disc saw for laminated glass, tweezers, toothpick (to rescue your teeth) and keyring. The window breaker and disc saw can be replaced since they are subject to a lot of use and wear. The tool has probably everything that is needed to rescue somebody trapped inside a car, the windows can be broken, the laminated glass can be cut and the seatbelt can be cut too, probably in a planned rescue bigger tools will be used for a faster operation but in an improvised emergency this can certainly be a very useful tool. It is my idea that the tool makes more sense for the rescuer than for the eventually trapped victim, a more simple window breaker/seatbelt cutter makes more sense for an emergency tool inside the car. The rescue tool comes in a red pouch for easy visibility and retails for about $80. 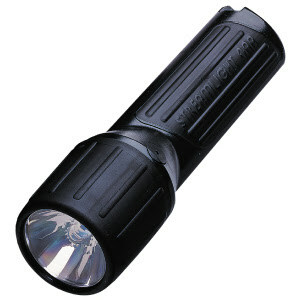 This is one of the many versions of flashlights Streamlight offers in pro-polymer bodies. The version tested is the Luxeon LED light with 4AA batteries, in our opinion probably the most interesting version of the line. The light uses 4AA batteries, either alkaline or lithium to power a Luxeon LED at about 67 lumen, using a deep smooth reflector the flashlight has a very concentrated beam that offers a lot of throw being able to reach distant objects. The propoly will out-throw many other more expensive lights in the market. The body is made of pro-polymer plastic with a clickie switch in the back, the body has some texture to help the grip and a pressure valve to release built-in pressure if your batteries vent. O-rings make the light waterproof and dunkable with very good sealing, the body is strong to resist normal drops to a hard surface without damaging the light or the body. The light is regulated up to 3.5 hours of constant output, after that the light will keep running in a dim mode up to 6 or 7 hours. Being made of plastic it's an ideal light, when used with lithium batteries, for outdoor activities in very cold environments where a metal light can reach frozen temperatures and damage your skin. The switch can be operated with the gloves we tested without any problems. This flashlight is a classic for several reasons, it has an excelent runtime and regulation, it uses normal AA batteries and it is very strong and resistant, but what really matters is that for the money this is probably the best throwing light you can get outperforming other luxeon lights that are even more expensive. It is probably not small enough to be EDC but it is a very nice light to have. You can read more from the product page or order for $33 from Lighthound. Signal mirrors are the ultimate device for daytime signaling, in good conditions a good quality mirror can signal very easily up to 30 to 40 miles and can be seen from 100 miles. The Star Flash is a high quality mirror issued to the Air Force and NASA astronauts, it is made of Lexan Polycarbonate with a vacuum deposited mineral mirror. The center has a retro-reflective mesh and an aiming star. To use it you point the mirror near the sun but not looking directly at it, you then move it until you see a glowing ball in the retroreflective mesh, that ball is the direction where the mirror is reflecting the sunlight. You then move the mirror towards your target and make the glowing ball hit the target with small movements to make sure you are seen. Always practice because when you really need it you are probably going to have 30 seconds or so to signal a plane or helicopter if you need help. Don't practice aiming to planes or helicopters, you can always find a friend to help you practice without putting anyone in danger. The mirror can be used for emergency signaling and for silent communications in daytime. Being a mirror it can also be used to put contact lenses, applying camouflage, makeup etc. The Star Flash weights just 19 grams (0.7 oz) and is 2x3 inches long (5.1 x 7.6 cm), it is almost indestructible and if dropped to the water will float. The retroreflective mesh and aiming star work very well and after a little training the mirror will be easy to use. The difference with very cheap mirrors is how you can really aim with the mesh, it may seem simple to reflect the light of a mirror in a wall or tree but if you have to aim to a little airplane that is miles away from you then the task is not so simple and the difference between a good quality mirror and the cheap one is greater. A must-have component in any survival kit and probably a must-have item for any outdoor activity. You can check more information from UltimateSurvival's website, the manufacturers of this mirror and you can order for $7 from this site. 4.837"x 3.682"x 1.652" external and 4.003"x 2.488"x 1.293" internal. From that size they go bigger up to laptop sized boxes etc. The box has a rubber seal to make it waterproof, it can be put under water up to 100 feet without leaking, I wouldn't probably call it a dive box but they are fine for all your outdoor activities including boating, river trips and related. The boxes of course float so if the contents are not extremely heavy your kit will float and be protected if dropped into the water. Crush resistance is based in the resistance of polycarbonate the material that makes the clear cases. It is fine against most drops and hits. 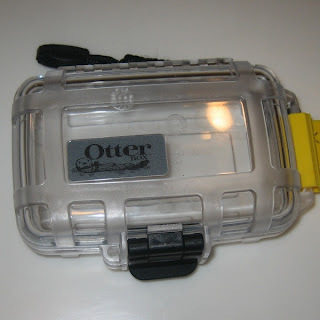 The Otter Boxes are in our humble opinion not as strong and well built as Pelican Cases, but they are certainly a good alternative for your kits and gear. As long as you have things that need to be protected from impacts and water this cases in the adequate size will be useful. You can get them from $10 from Lighthound. 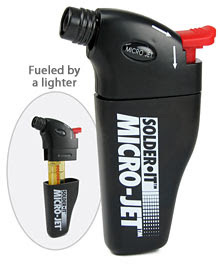 The Micro-Jet is a buthane torch with piezoelectric ignition. The really interesting thing is that this torch can use a disposable buthane lighter as a cartridge if no lighter is available it can use a refillable cartridge also included. Not all the disposable lighter brands will fit but the following ones do: Scripto/Toaki (Mighty Match, Ultralite, Vesta, Graffiti) or Calico (Jeweltones) and others might fit if they have the same size. Bic lighters do not fit. Using the buthane in the disposable lighter as fuel the micro-jet will produce a very hot blue flame that will be wind resistant and will be able to light and melt many different things. The torch can be used in any application where a strong flame is needed, cooking, melting, paint removal, hobbies, jewelry etc. It is also good for camping and outdoor activities since the strong wind resistant flame will be able to light a fire with less effort than a normal disposable lighter. Refills are as cheap and easy to get as getting a lighter that fits. We liked the ability to use the torch for projects and hobbies without worrying about fuel running out, you can always have some lighters as cheap refills. The runtime is aproximately 20 minutes with a normal "charge" and the flame burns at about 1300C (2400F) the size is 4.3" x 2.6" x 1" (11 x 6.6 x 2.5 cm). It works great to fuse paracord and melt plastic. You can order for $20 from Cabelas. This is a portable tri-band radio capable of receiving SW, AM and FM transmissions. The radio has a LCD display to show the selected band and station, this display does not have a backlight. The antenna is telescoping. Short Wave reception is very good, you can pick most of the World Wide SW stations without any problems including clock signals and others, AM reception is also very good and FM is fine. You can listen using the built-in mono speaker or for FM radio you can listen in stereo using the included earbuds. 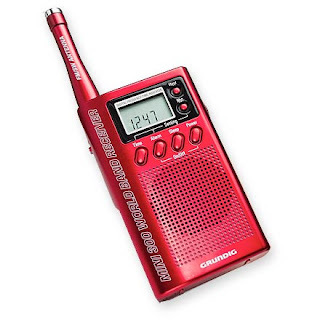 The 6.6 x 2.5 cm radio radio uses two AA batteries and weights only 4.7 oz. Besides the radio it has a sleeping timer to auto turn off the radio after a programmed time and also a radio alarm that will turn the radio on on your preferred station at a given time. The package includes earbuds a carrying pouch and a SW listening guide. The radio has nice features and very good reception, SW reception can be improved adding a coil antenna clipped to the telescoping antenna but we don't think that is a need unless your station of choice has very bad reception, for most SW stations tried the radio was clear, sometimes the frequency that you have to tune in the LCD display is not exactly the frequency of the station so keep trying. You can order online from REI for $30. The Fenix L1DCE is a Cree LED flashlight powered by a single AA battery, the switch is a reverse clickie in the tailcap. This light has different levels of operations and a particular dual-mode operation. There are two modes of operation for this flashlight: Normal and Turbo selected by twisting the head of the light from one position to the other. In normal mode you can use the light in 4 different modes: low, medium, high and SOS you switch modes pressing the tailcap switch halfway going from low to medium, then high and then SOS. In Turbo mode there are two modes: turbo and strobe, switching between modes in the same way as before: with a light press of the tailcap switch. The light is made of grade III anodized aluminium, excellent to resist hits and impacts of any kind and to avoid getting scratched if carried in a keychain. It can stand on its tail to be used in candle mode for room illumination. O-rings make the light water resistant and dunkable. The lens is coated with an anti-reflective treatment. With 9.7 cm is not exactly a keychain light but can be used in a keychain if you want. The brightness and runtime depends on the mode of operation, from 9 lumen and 25 hours of runtime in low to 90 lumen and 1.5 hours of runtime using the turbo mode. An electronic circuit provides regulation so the brightness of the light will be constant for the selected mode regardless of the state of the battery. There is a version of this light: the L2DCE that takes 2 AA batteries using the same head so the L1DCE can be used with a rechargeable 3.7v 14500 battery. With the 14500 battery the light can reach up to 130 lumen and it is still a single cell battery but you will lose some of the low level modes until the battery voltage drops and the regulation circuit kicks back. This incredible output shows the amazing efficiency of the Cree LED able to produce an incredible amount of light with a single battery and very respectable runtime performance. The beam is a combination of throw and sidespill with some noticeable rings so it won't be a pure white beam when shined over a wall. Due to the many modes and the brightness this light is both useful for outdoor and indoor activities doubling as a light that can reach far when outside and as a nice tasklight in low mode inside. An amazing light capable of producing a lot of light with a single AA battery and capable of producing an incredible amount of light with a 14500 battery. You can order for $52.50 from Fenix-Store. 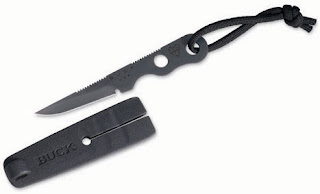 This is a multipurpose tool that can be used as a mini survival kit. It has several elements; the two sliding orange wings have a 5x magnifying glass in one wing and a mirror in the other. The front of the tool is a white LED flashlight, next to it there is a digital thermometer that can display temperature in Celcius or Farenheit. The next element is a liquid filled floating dial compass, at the end opposite the LED light there is a whistle. In the bottom the tool has a dry storage compartment, that is long and flat so it is useful for matches, some very thin tinder and maybe a folder bill or some paper. Pills may or may not fit depending on their size. The tool weights 2 oz (56g) and measures 4 3/8'' x 1 1/2'' x 3/4'' (11.1 x 3.8 x 1.9 cm). The flashlight and thermometer are powered by two CR1616 coin cell batteries. Compared to other similar tools with several elements this seems to be a of a higher quality, the compass is very good, the thermometer works perfectly and the dry compartment is very useful. The whistle is ok to signal for attention and the magnifier works fine and can be used to start a fire if aimed carefully. The mirror is not really suitable for serious signaling. This is a nice tool offering a good selection of tools, most of them will be probably used as backups for your bigger more serious tools but they can certainly work if needed. You can read more at the product page or order for $20 from REI. This is a pen created by Knife maker Fred perrin to double as a defensive weapon. When the pen is closed the metal body can be inmediately used as a kubaton or impact device, this is also valid for other pens but this one is built and designed not to break in pieces if you use it as a impact tool. The pen weights 25 grams if that is important to you. If you open the pen removing the cap you will see that the cap has a very acute angle of contact with the body, this acute angle can be used as a cutting weapon and might really produce a lot of damage, this is affectionly known as a DNA sampler. When you are not trying to save yourself from a fight with the bad guys you can use the pen to write notes, it writes well and it uses standard ink cartridges that are easy to get for refills. The pocket clip is short but strong, not good for a jeans pocket but certainly fine for a shirt pocket or a notepad. You can get it for $20 from this site.